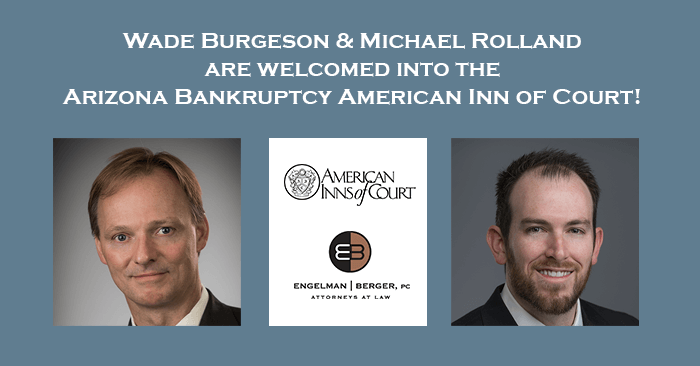 Congratulations to attorneys Wade Burgeson and Michael Rolland for being invited to join the Arizona Bankruptcy American Inn of Court (“ABAIC”). The ABAIC provides an opportunity for judges, lawyers, legal educators, law students, and others to meet regularly to foster a greater understanding and appreciation of bankruptcy law, the adversary system in which it exists, and to foster interaction and collegiality. The ABAIC is one of 350 chartered American Inns of Courts established around the country with the goal of inspiring the legal community to achieve the highest level of professionalism, ethics, civility, and legal skills through example, education and mentoring.